I started blogging several years ago for fun. I was blogging about fashion at my old blog named Miss Chief, but I grew tired of it as I got older. It was fun while it lasted, but I just don’t find fulfillment in blogging about clothes anymore, plus I’ve become really lazy when it comes to dressing up. And then, I started blogging about food, something that I loved and still love. Later on, my feet started taking me to places, so I began writing about that too. From Miss Chief, I moved to a new blog, which I called The Tiny Wanderer. However, no matter how much I like that name or how much it suits me appearance-wise and personality-wise, I had to change it. Why? 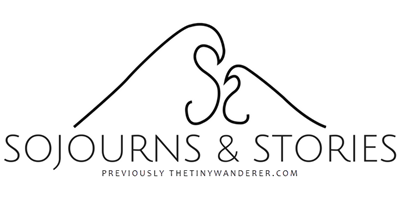 Well, for starters, there’s another blog called Tiny Wanderer. When I bought the domain name thetinywanderer.com, I didn’t bother to check if there was a similar one that already existed. It was an impulsive move, and it has caused a bit of confusion with my readers, that’s why I had to move my content to this new blog- Sojourns and Stories. Here, you will find honest travel stories, as well as guides and tips to help you maximize your traveling experiences. In this blog, you can also expect unbiased reviews for various hotels and resorts, as well as for cafes and restaurants. I hope you will enjoy reading this blog as much as I enjoy creating the content. My name is Faith Mari, and I am a tiny twenty-something female whose only goal is to be happy. Also, I’m a beach lover who finds solace and peace of mind at the smell of sea breeze, the feel of sand in my toes, and the sound of the waves crashing to the shore; an adventure seeker who is addicted to the thrill that new experiences bring upon; an animal lover who lives with three dogs (sometimes four), six hedgehogs, a sugar glider, and a bunch of mammals that I call my family (lol); an introvert trying to explore the extroverted world; and a food-loving weirdo who never gets fat. Grateful that I’m gifted with an outstandingly speedy metabolism, I still wish to gain a few more pounds so I won’t keep looking like a walking skeleton. Lastly, I love to write and tell stories of places I have seen and things I have experienced in my travels.